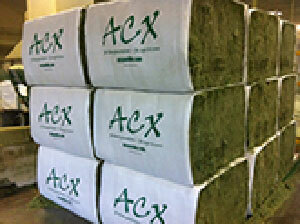 The 450kg MACX-Bale sleeve is available for most products and feed mixes from all Al Dahra ACX hay processing facilities. 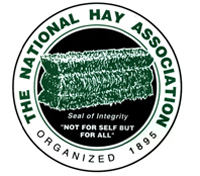 MACX-Bale offers the maximum weight, fiber, leaf retention, consumption, and feeding options. 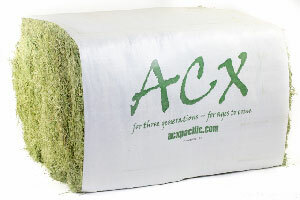 The MACX-Bale package contains no wires, is easy to handle, and is easy to feed. Available from Al Dahra ACX Ellensburg, Al Dahra ACX Vacaville, and Al Dahra ACX Wilmington, each 40' HC container can be loaded up to 26 MT of MACX-Bale sleeve product depending on U.S. origin and overseas destination. 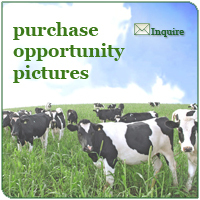 Maximize your feed and maximize your savings by ordering MACX-Bale packaging today. Contact ACX for more more information.